VocabularySpellingCity offers a wide variety of word lists to complement any curriculum. These lists can be imported into your account while you are logged in. Build literacy with vocabulary and spelling. Import word lists to study parts of speech, word parts, beginning spelling, academic vocabulary and more from our Teaching Resources. The Search menu option allows users to search for specific word lists by topic, teacher/parent, or school. Narrow Your Results allows users more control over their search. 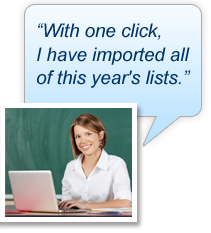 Customers searching by list name can narrow list searches by grade level and time period. When looking for a teacher or parent, there are additional filters to allow you to search by state and/or school. Recent Lists tracks the last seven lists that you have accessed. Why can’t I find my teacher when I search for her last name, i.e. “Smith”? Smith is a common last name and we suggest using the option available to Narrow Your Results by state or school. How do I find my school if it is not in the United States? Search by “other countries” within the Quick Search box.